Why has it taken me so long to get a peach blush?! This shade is amazing - I just recently posted a review about this blush (you can see the full post here!) It is more peachy-pink which is gorgeous! I told myself this would be the perfect Spring/Summer blush, but I can't stop wearing it right now too! Bath Time Box (Store) Oh La La Oil - After Bath Nourishing Oil ~ $8.50. The super, non-greasy oil blend is perfect for after the bath or shower. After you step out, lightly towel off and then apply the oil, rubbing it in well. I actually used to use a body oil all of the time after a bath or shower, and I don't know why I stopped! I was recently sent a few body oils to test out from another company and it made me go through my stash and see what else I had! This body oil actually came in a Bath Time Box from last year, but I started using it and it is great! It has the lightest scent of Almond Oil and it applies smoothly and absorbs quickly and leaves the skin feeling amazing! Love! Maybe this seems a little crazy, but I just had the Lush Snow Fairy Shower Gel in my favorites last month, but this scent is one of my favorites! The scent is described as bubblegum and vanilla, so if you love sweet scents, this is a good one. This lotion is also really great - it lasts all day and keeps my skin moisturized! (Bonus - I use this with the Oh La La Oil and it is everything!) If you are interested, I did just feature this on my Skincare Sunday post and you can check that out here. Too bad this is a seasonal item as I would by it all year! Stila Stay All Day Waterproof Liquid Eye Liner in "Black" ~ $22.00. This easy-glide, quick-dry precision liner stays in place until you say when—no smudges, feathering, or running. The thin, marker-like tip is easy to use, even for the beauty beginner, and delivers any look—from a thin line to a bold, dramatic stroke. It goes on smoothly without skipping, smudging, or pulling, and lasts all day. There is no other words to describe this other than HOLY GRAIL! How have I not featured this on a Favorites post before? I have used this product for well over 2 years and just can't repurchase another eyeliner! My recent trip to Hawaii reminded me that this product can not be topped - I wore this all the time (I even wore this snorkeling) and it did not budge at all! Amazing! 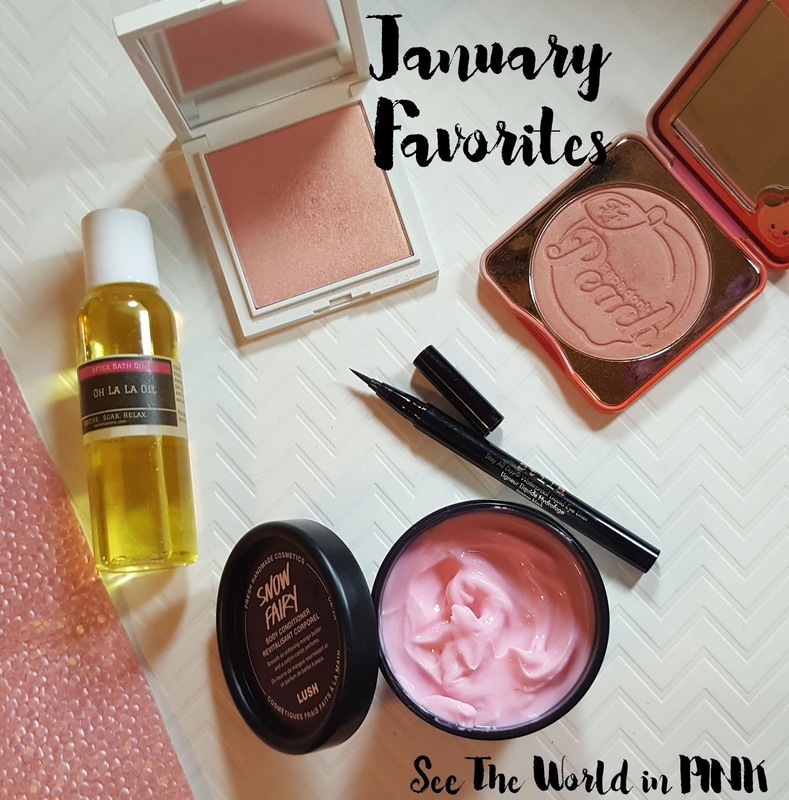 What have you guys been loving in January? If you are interested in checking out my past Favourites, head here! I have to try that Stila liner! I just finished up my jesse's girl liquid liner, and will have to try the Stila one, once I get through some of them in my hoard lol. I love the Snow Fairy body conditioner as well, I wish they sold everything snow fairy all year round! Annnnd, every time I see anything posted about the sweet peach blush, I want it! I keep telling myself no, but I fear I may give into tempation soon! The stila liner is a must!!! And the peach blush is amazing - lol, I knew I wasnt going to be able to resist trying it and I love it!